Yes, it’s true… another year has passed and a new one lies before us. I don’t know about you, but for me this time of year is a mixed bag. I find myself looking back over the past year and counting my blessings, going over the many lessons I learned, and immersing myself in gratitude for the love, connection, people, and experiences that have filled my life. The other thing I find myself thinking about, and sometimes dwelling on, is that I realize how much I didn’t do or didn’t complete that I had intended at the beginning of the year. Often, this feeling lingers, and I find myself stuck in regret. Why can I more easily be drawn to the negative than the positive? I don’t think this is uncommon, but I sure don’t like to stay in this space. The good news is, I have developed a New Beginnings Ritual that helps me release the negative and open myself up for the positive. It’s simple, doesn’t take a lot of time, and sets me up for a fantastic future. Because it works so well for me, I thought I’d share it with you. Enjoy! There are 3 simple steps to this ritual. You can spend as much or as little time as you like on each one. The thing that makes this ritual even more powerful is when you put yourself into the feeling place as you move through the steps. Be intentional, clear some quiet time, and get ready for an opening! Other things you might like to release are specific emotions that keep you feeling stuck like: anger, guilt, pain, worry, fear, resistance, frustration, jealousy, disappointment, or hate. You might choose to write down the list of things you want to release. Writing helps to ‘get it out of you’, and the paper can be used in a ritual of release. Now that you have these things top of mind, the next step is to get into the feeling place of each one. Recognize that it was in your life for a reason, and like all things, in some way it was here to do some good in your life or to teach you a lesson. Thank it for showing up and playing a part in your life. And now that is no longer necessary, you may release it. Ask it to leave your life, your mind, and your heart, leaving behind only the lessons. If you wrote your release items, you can do a ritual to release them. Shred them in a shredder, burn them in a fireplace or the flame of a candle, or simply tear them up and throw them in the trash. If you didn’t write them, you can figuratively release them by visualizing them in the palm of your hand and offering them up to the sun or moon or to the flame of a candle. your new car, house, pet, etc. Your gratitude list may also include ‘regular, everyday’ things like: having an income, your home, food to nourish you, being able to see and walk, being alive, clean water to drink, your cell phone and computer to connect you. You can write these things down and use them to refer to later to remind you of all the great good that has been a part of your life. I highly recommend this! Feel the feeling of gratitude deep in your heart. Rest in this space and allow it to envelope you with its beauty and glory. Know that you are innately worthy and deserving to feel good, and the fact that you have enjoyed these things over the past year is proof of it. Breathe it in. Rest in gratitude. Now that you have your list, read through it and feel the feelings that each one brings. It is the feeling place that has true meaning for you. Now, let’s take it a step further and a little bit less tangible – Write how you’d like to FEEL. Includes feelings like: happy, fulfilled, content, peaceful, joyful, loving, loved, accomplished, complete, confident, courageous, kind, patient, etc. Setting the intention to bring more of these feelings into your life on a regular basis will help you to live and be in this space every day. I would suggest focusing on a few of the words/emotions as a sort of your ‘go-to’ feeling place for the coming year. These words can also serve as a guide for making decisions in the coming days, weeks, or months. Keep these lists with you and read them every day. This keeps them top of mind and helps you stay on track with your intentions. It also keeps you motivated and energized. You can burn or throw away your list knowing that your intentions are within you and trusting that the Universe will hold them and bring them to you. I hope you enjoy this ritual and I’d love to hear your thoughts or experiences when you do it. Keep in mind that it’s not only a New Beginnings Ritual. You can do it anytime to up level your emotions, get back on track, and give you a boost. 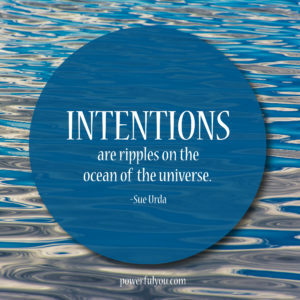 The combination of clearing, gratitude, and intentions is powerful – just like you! Wishing you an outrageously awesome and blessed year ahead!